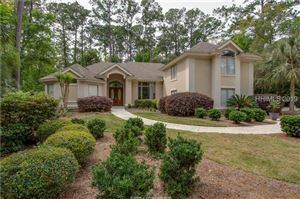 Palmetto Hall is a private golf community sitting on over 750 acres just off Highway 278. With only 523 homes sites, Palmetto Hall Plantation is one of the newest developments on Hilton Head Island and features some of the best golf, swimming, and tennis that the island has to offer. With courses designed by two of golf’s most prestigious architects, you won’t find 36 holes of golf more beautiful, well designed, or challenging. Palmetto Hall is one of the only areas on the Island where residents are allowed to drive golf carts throughout the development. Beautiful Charleston-style homes with sweeping porches adorn the community and lagoons are throughout, providing an ideal place for residents to fish.